From an early age, Anjelica Glosup forged a remarkable bond with horses and became a champion equestrian. But following her dream to teach the next generation of horse riders meant disregarding the naysayers and overcoming many obstacles. 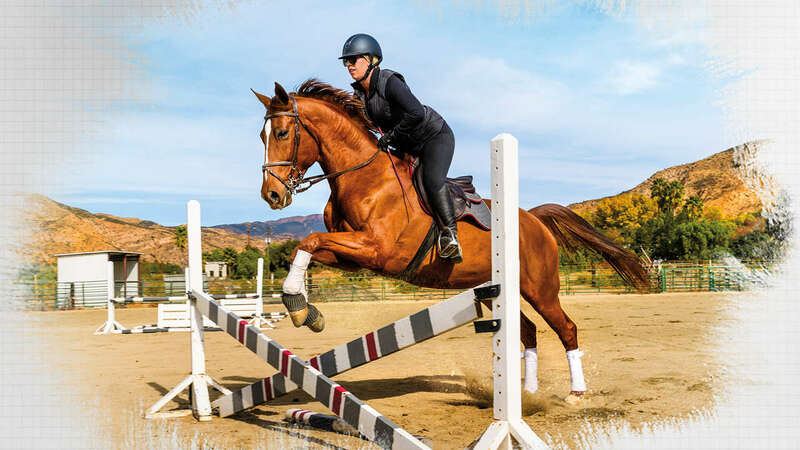 A champion equestrian discusses overcoming obstacles and teaching the next generation of riders. Gray Levett founded an award-winning photography shop known worldwide for its legendary service. Emmy award-winning sound designer, David Kitchens creates sound for movies and TV shows. Mercedes Austin’s stunning ceramic tile mosaics and her success are an inspiration to other artists. Lars Najbjerg is a champion aerobatics pilot pushing the limits of what is possible. Pam Ryan-Anderson works year-round to help bring a Christmas village to life in Clearwater, Florida. Charismatic and competitive, Evgeny Raev is a force to be reckoned with in ballroom dancing. Stacy Sass heads a thriving company that makes American steel for projects throughout the country. Bob Salerno's trophies in the sport he pioneered led to his induction into skiing's hall of fame. Drs. Rick and Vikki Petersen pioneered a multi-disciplined approach to complex health problems. A businessman discusses how designing exquisite landscapes helped him to discover purpose in life. Doc Wong created a series of motorcycle safety courses that is credited with saving lives. A young entrepreneur is building his business, and living his dream, by helping people have fun. Hossam Ramzy’s rhythms made him the go-to percussionist for movies and music’s biggest stars. Italian Giulia Bartolini proved doubters wrong and became a star in the world of women’s water polo. Aaron Kyro turned his passion for skateboarding into a career and now inspires others. Follow Mark Isham’s incredible journey from college dropout to the top of the music profession. Funnyman Andrés López is a Latin American comic sensation building his own entertainment empire. A roofer finds freedom and joy working at the top of a picturesque Swedish city's skyline. Greta Del Sal transforms a sleepy mining town in South Africa and rejuvenates an entire community. Artist Carl-W. Röhrig sees beauty in unusual places and is known for his fantastic imagination. Lynette Barry’s risks everything to establish her company into a major force in the energy industry. An award-winning designer who is living his dream of creating beautiful lighting fixtures. The Jive Aces, Britain's top swing band, discuss fame and their commitment to helping others. Two Italian entrepreneurs take the motorcycle racing world by storm and do it with style. An inside look into a unique animal ER and the visionary veterinarian who made it all happen. A charismatic engineer shows off the robots that revolutionized film and television production. Nick Ferguson made his dream of playing in the NFL come true, despite all the odds. The banjo is saved from the dust-bin of music history by a married couple from San Diego, CA.